European Windows 2012 Hosting BLOG | SQL Server 2016 Hosting - HostForLIFE.eu :: How to Get The Header Information Of A Table in SQL Server? 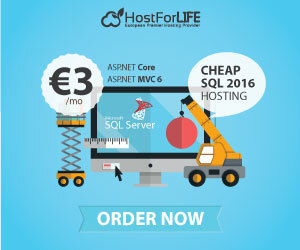 SQL Server 2016 Hosting - HostForLIFE.eu :: How to Get The Header Information Of A Table in SQL Server? Now, I will show you how to Get The Header Information Of A Table in SQL Server. If someone asks the question, "How do I get the header information of the table in SQL Server?" the first solution that arises in our mind will be "use any condition that never matches," like 1=0 or 2=0. However, in this case, we only get the header information of the table, and no result will return. It is true that using the above solution, we will not get any data and the result will be the header information of our table. But this is not the best solution because in this case, SQL Server reads all rows and compares the conditions each time. That increases the turnaround time and resource complexity. For this, SQL Server provides the "SET FMTONLY ON" keyword. "SET FMTONLY ON" returns only metadata to the client. It can be used to test the format of the response without actually running the query. This method returns header information without performing any read operation.